Perinaldo - superbly appointed villa with pool & fantastic views - best in area! This outstanding Villa with pool has a private and peaceful location at the bottom of a 70 metre track. Not overlooked in any way and with extraordinarily beautiful views down the valley to the sea. There is Wifi throughout the villa. The master bedroom is en-suite. The bathroom has a unique sunken bath, roman in style, complete with shower. Two further bedrooms each of which has two single beds share a bathroom with bath/shower. The single beds in the these rooms can, upon request, be made up as a double bed. All bedrooms and bathrooms have mosquito blinds fitted on the windows. There is a large superbly equipped kitchen with breakfast bar, American fridge and dishwasher. Utility room with washing machine, iron and ironing board. Clothes line. The kitchen opens to a fantastic spacious lounge/dining area with fireplace. The lounge contains two triple seater sofas one of which converts to a fully mattressed double bed increasing the accommodation to 8 (if required, and at extra cost). You can dine inside or 'alfresco' under the veranda. There is a 32' TV with satellite reception providing a choice of channels. DVD player with wide range of DVDs to suit all tastes. Many games, chess and playing cards. The 8m x 4m unheated pool with stepped access and pool lights has a uniform depth of 1.45m - NO DIVING. Four high quality sun loungers. The village: The village of Perinaldo is lovely and can be reached in 5 minutes either by foot, using a path adjacent to the road at the top of the track leading leading to the villa, or by car. Perinaldo has a post office with a cash point; pharmacy; mini-market; bakery and a choice of bars and restaurants. Local culinary specialities include 'carciofi' (artichokes); olive oil (made from Taggiasca olives); dishes made with cinghiale (wild boar); Rossese wine. It is a relatively quiet village but hosts a number of festivals throughout the year and many in the summer and August in particular. For all star gazers, Perinaldo has it's own observatory. The villa is equipped with it's own astronomical telescope and guide book on gazing at the stars. The village is surrounded by some fantastic countryside offering some challenging hiking and mountain biking opportunities. A little further a field: Inland, the villages of Dolceacqua with it's castle and bridge captured in paint by Claude Monet and Apricale are a short drive away. Pigna, with it's thermal spa, and the ghost village of Bussana Vecchia are a little further away. Bordighera offers a touch of class and a blue flag beach! Close by in the hills behind Bordighera is the ancient principality of Seborga. The magnificent Hanbury Gardens at Mortola and caves at Balzi Rossi, both very near the French border are just a 25 minute drive. Menton and beyond...: Explore the treasures of the Côte d'Azur stretching from Menton in the east to San Tropez in the west. Menton, host to the lemon festival each February, is known as the 'Pearl of France' and is thought by some to be without a peer! We love it. A little further along the coast past Roquebrune and Cap Martin is Monte Carlo home of the casino, the Grimaldi Royal Family and the Monaco Grand Prix! Next is Cap d'Ail with the villages of La Turbie and Eze behind in the hills. Taking any of the three 'Corniche' you can reach St Jean Cap Ferrat, former home of countless movie stars and singers and the location of the magnificent Ephrussi de Rothschild Villa. Next up is Nice with St. Paul de Vence and Grasse nearby in the hills. Cannes is just a little further along the coast. We are English (with a German surname). We had Villa Benara constructed to our own design after purchasing the land in 2006. We are very familiar with the area and would be happy to answer any questions you have about the Villa, Perinaldo and the surrounding area. Villa Benara is a unique modern design incorporating some traditional and unique features. A very spacious, social yet peaceful environment. The views are magnificent and the position is private and quiet. Our villa is the ONLY villa with a pool to rent in Perinaldo. Bath towels are supplied. There is a small supply of soap, shampoo, conditioner and shower gel for use by guests. Please help yourself to these items which are kept in a draw in the utility room. NO pool towels are provided. ALL BATHROOMS HAVE MOSQUITO SCREENS. Bed sheets and blankets provided. Large open fireplace set under a chestnut beam. At the edge of the quiet road adjacent to and above the Property or, AT THE CLIENT'S RISK, adjacent to the property ACCESSED DOWN THE TRACK. Very comfortable with all amenities. American fridge with ice and water dispenser. Full set for 6 + people. Sony speaker with lead to connect to your music player. There is a collection of English DVDs of films; TV series and documentaries catering to most tastes. There is a selection of books in English to suit most tastes. Please feel free to leave behind ones you bring and take home you can't finish reading during your stay. Lawn and area planted with typical flowers and herbs. The villa is located in an old olive grove. Flat bottomed pool 8m x 4m - NO diving Please note that the pool is NOT heated and is only open between June and the end of September. Villa Benara is a fantastic villa with the most maginificent views down the valley to the sea. It enjoys a uniquely peaceful and private location whilst only a short 10 minute walk to the village. Access to the villa is down a relatively steep 70 metre track. The track leading to the villa can, with great care, be driven up and down in a medium sized vehicle. ANY USE OF THE TRACK BY CAR IS AT THE DRIVER'S RISK. We recommend that you access the villa by foot and park your car in the area adjacent to the quiet road where there is ample room to park. Please take care when walking down and up the track especially where children and the elderly/infirm are concerned. The villa has many outside lights that, when switched on, provide a well lit environment at night. The grassed and planted areas are sprinklered. The villa is equipped with a six string acoustic guitar. We have full wifi coverage INSIDE the villa. Wifi is available in the village at the 'Au Gaggian' bar/restaurant. Stayed there last summer, family of three. A 9 yo and two adults. 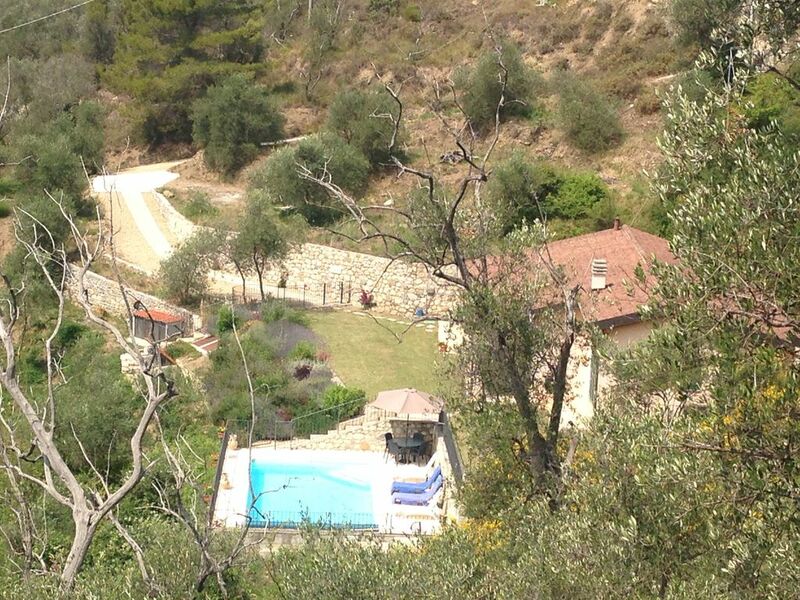 Excellent home, very well equipped, great pool and fantastic views towards the med! Nice hub to visit the area, the little medieval villages in the area, but also great for day trips to Monaco and the French cote d'azur. Due to the altitude it cools a bit a night, which makes it even more comfortable during summer. Only downside... but what is in the name... is the road to the place.... it is a bit of a challenge. But you will get adjusted to that too after a few trips up and down to the sea..... great! would very much recommend it to everybody who like privacy :-)... the rating is more like a 4.5 to us. Not a 5 as it has no airco and the mattresses and pillows are a bit hard. But that is obviously very subjective. One of the benefits of the location are the uninterrupted views we have. Those views come with a small price which is that the road from the coast up the hill to the villa, unsurprisingly, has its twists and turns. The villa is advertised as having no aircon. All bedrooms have fans for those occasions when it is very warm at night. I'm sorry that you found the mattresses and pillows too firm. I'm sure you understand that it is impossible to meet all preferences. We do hope that you choose to stay with us again. A lovely villa, equipped like a home, not a holiday let, with large patio, lots of seating and loungers, good pool and surrounding area, and table tennis table, where many battles were fought. Situated a ten minute walk up a steep path and steps, Perinaldo is lovely, quirky, an old hill top village, with a couple of good restaruants (we only went Au Gagin and and La Riana, now German owned) and live music. We want the villa to be a 'home away from home for our guests' and we are delighted you found it so. We spent most of our days just lounging by the pool and taking short trips to the charming villages in the area. We're so pleased that you enjoyed your holiday staying at Villa Benara. What is immediately apparent is that primarily Villa Benara is a home rather than an exclusively holiday villa business. Consequently throughout the accommodation there is evidence of the owners, Michelle and Eddie's personal stamp upon the property. Notwithstanding their personal input and affects they are very generous to their paying guests in that everything they have, golf clubs, beach/pool equipment etc etc, is made available for use. This villa is obviously a labour of love which is seen from the detailed care that has been poured into the place from the well tended garden to the amazingly comprehensively equipped kitchen including sewing kit for emergency repairs should anyone be so inclined. The villa's location to the village is convenient and the highlight for us was the restaurant Au gaggian where the restaurant is above the bar and opens at 7pm as well as serving at lunchtime. The restaurant is the domaine of Ursula who provides a warm welcome and the freshly prepared and cooked food, typical of the area, is not to be missed. The views from the villa to down the valley to the Mediterranean in the distance are spectacular. Similarly is the view of the mountains on the walk up into the village, whilst a walk around the perimeter of Perinaldo also provides stunning views of the valley down towards Apricale. We stayed for the month of September arriving to 30 degrees which dipped to a very comfortable 25 degrees for most of the month. We were able to enjoy trips to Menton with ease as well as a visit to Saint -Jean-Cap-Ferrat where we walked around much of the peninsula with a bottle of iced water (essential). Sanremo is an easy drive and worth a visit with its beaches and access to cycle hire and a long cycle path on a well maintained disused railway ending at San Lorenzo with numerous refreshment stops along the way. If one is inclined a trip to Portofino is possible but although picture postcard perfect it is a very expensive tourist trap which starts upon arrival at the carpark and on into the restaurants, some of which provide lousy food and service and charge a premium for the privilege. If I was going to revisit I would park and eat at S. Margherita and catch the regular ferry to Portofino for a meander around the town and harbour. Villa Benera provided us with a very comfortable base from which to explore this part of the Mediterranean as well as being a great place to spend the day relaxing around the pool with family. Beautiful villa with all mod cons and wonderful views. We had a lovely stay at Villa Benara. The villa is spacious, very clean and decorated to a high standard with all mod cons. We have three children under 6 years and it was perfectly suitable for all of us. The swimming pool is a really good size and very safe, gated and set a little bit away from the property with little chance of the children being able to gain access themselves. The location is also good. about ten minutes walk to the village, local bar/restaurant and bakery. We would definitely like to return. What can we say except "Come back soon". We had a fabulous holiday at Villa Benara. Within easy distance of Nice airport, the views from the villa are amazing. You never tire of looking down the valley towards the sea. The villa was like a home from home - it had everything you would want. And was a little bit of luxury. The location was ideal. It was quiet and secluded but within easy walking distance of Perinaldo. It took us 20 min with two small children, up a traffic-free path. Coming home was half the time! The village was great. It has a bakery and the two (out of three) restaurants we went to were welcoming, excellent food, and good value-for-money. There was lots to do and see in the surrounding area. Monaco was only a short distance, and the nearby villages were stunning. But we were happy to stay at the villa, take in the marvellous views and swim in the (warm) pool. We very much hope we can return one day. We are so pleased you had a great holiday and enjoyed the villa. Thank you so much for your kind words - please come back soon. Spread the word but don't tell everyone! Perinaldo is a delightful mediaeval village in the Province of Imperia in the region of Liguria. The village is located on a ridge in the hills about 15 km from the nearest blue flag beach at Bordighera. The birthplace of the 17th century Italian astronomer Giovanni Domenico Cassini; the village has it's own observatory, Perinaldo commands fantastic views south down the Vallecrosia to the coast and north to the Alps. Villa Benara sits nestled in a peaceful and private location just below the western end of the village and is fantastically positioned with magnificent views down the valley to the sea. Menton in France is 30 minutes and Monte Carlo is just 45 minutes away. The nearest airport is Nice at a one hour drive. Nice, one of the best airports in Europe, is served by Easyjet, BA, Norwegian Air and Ryanair with exceptional road access and car hire facilities. This modern villa with pool in landscaped surroundings offers an ideal base for a holiday and place from which to explore all that the locality offers. The villa comfortably sleeps 6 in 3 bedrooms but for an extra charge can accommodate up-to 8. Golf: Circolo Golf degli Ulivi Sanremo. The changeover day is SATURDAY. Other days and rental periods considered upon request. Rental periods of more than a week that do not end on a Saturday will attract a surcharge. Arrival time preferred no earlier than 5pm. Departure time no later than 10am. The rental rates are based on the villa being occupied by a group of up-to 6 people. Additional people may attract a charge.